Remove the meat from the casings and shape into tiny little meatballs. 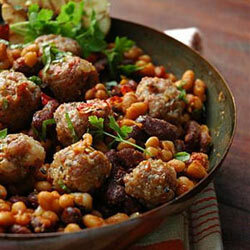 In a "cassole" or pot, heat the olive oil and fry the meatballs until they are golden brown on all sides. Set aside and keep warm. In the same pot, sauté the onions and garlic until soft. Add more olive oil if you need to. Add the tomato, red wine and thyme and allow to cook for about 5 minutes, just to reduce the sauce somewhat. Add the beans and the meatballs and warm through. Serve with chopped parsley, fried breadcrumbs or crackling if you have. Heat some olive oil to a pan, add 1-2 cloves garlic, crushed. Now add about 1 cup fresh breadcrumbs and toss until it becomes golden in color. Season with a little salt. Reprinted with permission of My Easy Cooking. To visit My Easy Cooking’s blog, click here.